Keep your fleet on the road longer with vehicle and chassis lubrication systems from Midwest Lube, Inc., of Elk Grove Village, Illinois. Our easy-to-install vehicle lubrication systems offer preventive maintenance at its best. 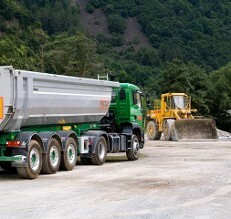 The XGS is a unique system suited for mid-range to heavy-duty vehicle lubrication, including commercial and transit vehicles and material handling trucks. The system includes an air-operated grease pump complete with reservoir and fitted with calibrated pump injectors. It also features a radial manifold system linking the injector to a specific bearing and a variable time cycle controller (12 VDC or 24 VDC) with a test button for checking the system operation. The XGS system comes in increments of 12 up to 96 and can handle standard grease, semi-fluid grease, or oil. Contact us at (847) 690-0063 in Elk Grove Village, Illinois, for an easy-to-install chassis lubrication designed to save you money.